The "alibis of ignorance" are lanced by an Idaho physician discussing long lasting colds. Both grippe and influenza are diagnosed as an inflammation of the sinuses or nasal sinusitis. He recommendation is no drugs, but an optional surgical incision to drain the nasal pus. The front page reports that TB hospitals have been set up in Lyon, France to handle new cases that have been averaging 65 per week. 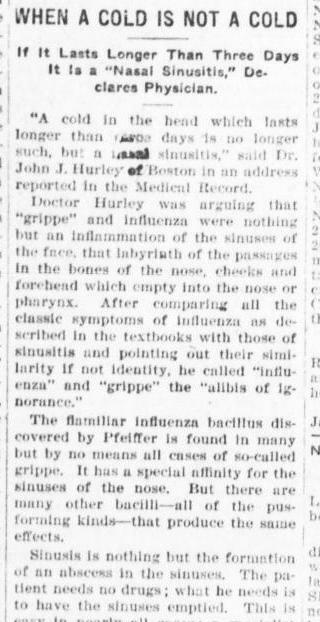 Source: "When a Cold is Not a Cold," The Idaho Recorder, salmon City, Idaho. January 18, 1918. Page 3, Column 2.